Whether you’re looking for a new pen display or your first graphics tablet, we’ve got all the best drawing tablets right here. Shopping for a new drawing tablet? You're in luck! The choice on the market is amazing right now, with options available in all sizes and configurations. Whatever your drawing needs and specialities, there's definitely a drawing tablet that's perfect for you. The only challenge is finding it. From dedicated graphic specialists like Wacom and Huion to tech giants like Apple and Samsung, loads of companies are getting in on the action – and that means that when it comes to choice, creatives have never had it so good. So what's the best drawing tablet you can get? We're here to help. Right now, the very best drawing tablet you can buy is the Wacom Cintiq 22HD touch pen display. But it also has strong competition in the form of Apple’s latest iPad Pro 12.9, released in November 2018 and boasting some serious processing power. If you are thinking of opting for the latter, it's worth looking at the various iPad stylus options too before you commit to buy. Of course, both of these tablets involve a significant cash outlay, so if you’re on a stricter budget then it’s worth looking at some of the more wallet-friendly options out there such as the Huion H430P. Ultimately though, determining the right drawing tablet for you is going to depend entirely on how you intend to use it. (Scroll down to see our full list of recommendations. If you're new to drawing tablets, it's worth pointing out that there are three different categories to be aware of. You can read a more detailed explanation below. With this covered, let's look at the options. Read on to find the best drawing tablet for your specific needs and budget – and the best prices. Probably the most desirable drawing tablet on the market, the Wacom Cintiq 22HD touch enables you to draw direct onto its screen. It's generously sized so you can go large with your brush strokes, but the stylus is sensitive enough to cope with your most subtle expressions, too. The stand takes some getting used to, but enables you to switch between a near-flat configuration for drawing and an upright position for when you want to use the Cintiq 22HD touch as a regular monitor. All the basics you could want from a pen display are covered by the XP-Pen Artist 15.6: a reasonably sized drawing area, a comfortable pen with plenty of sensitivity levels, and a good screen. You don’t get quite the attention to detail or the advanced ecosystem of extras that Wacom provides, and the offset between the stylus tip and the on-screen cursor takes some getting used to, but this remains a pen display that can transform your digital creativity without breaking the bank. When you’re creating artwork, you want room to sketch freely and a pen that feels as close as possible to the paper equivalent. You’ll find both in the Wacom Intuos Pro graphics tablet: it's one of the purest drawing experiences you can get from a digital device. The pen provides over 8,000 levels of pressure sensitivity and a drawing area that – while it’s not the biggest available – gives you more than the area of a magazine to play inside. All this is supported by Wacom’s broad ecosystem of alternative pens and Texture Sheets to give your drawing surface a distinctive feel. Designers don’t typically require the range of movement that illustrators demand, making this smaller edition of the Wacom Intuos Pro graphics tablet just the job. As well as the drawing area, eight shortcut keys and a Touch Ring give you access to your most-used commands and tools, so you don’t have to keep flipping between your tablet and your keyboard while you’re focusing on iterating a concept. The Intuos Pro also supports multi-touch fingertip gestures, making it easy for you pan and zoom around your current document. If you’re not sure whether a drawing tablet is something you’ll use regularly enough to justify the cost, the H430P gives you all the basics without requiring an big investment. The drawing area is small, yes, but the pen is sensitive enough to give you a true sense of the creative benefits drawing tablets can bring. It may not take long before you outgrow this tablet, but it’s a very affordable way to get started. While not as affordable as some of its rivals from XP-Pen and Huion, Wacom's 2019 entry-level tablet is still much more attractively priced than many of its pro-oriented siblings. In the entry-level market it also has a trick up its sleeve in the form of the Pro Pen 2 stylus, which tops out at 8,192 levels of sensitivity, beating many similarly priced tablets. We found a lot to like about the Cintiq 16 in our review, especially its gorgeous display that shows off all the hallmarks of Wacom quality. It's really encouraging to see Wacom entering the new-user space, with a price point to match, and the Cintiq 16 is a welcome example of a Wacom tablet that doesn't require absolute fistfuls of cash to acquire. This is a fantastic entry point for any designer. XP-Pen's Deco tablets blend style with functionality. This matt black, ultra-sleek model doesn't only look good, but also feels good to use, thanks to its well-made pen and generous drawing area. It's well-designed in a workflow sense too, with customisable Express keys and a multi-functional dial in the top corner that allows you to set things up exactly how you want them, so you can spend less time fiddling and more time drawing. Drawbacks? Well, you could be justified in worrying that at 8mm, the Deco 03 is a little too slim, to the point where a moment's carelessness might cause damage to it. If that doesn't worry you, this is a great buy for a good price. The second Huion drawing tablet on our list is the H640P, which boasts a comfortable drawing experience in a convenient size for travel. If you work between studios or like to draw from a laptop on the move, you’ll need a drawing tablet like this that packs away handily – but still lets you draw with expression. 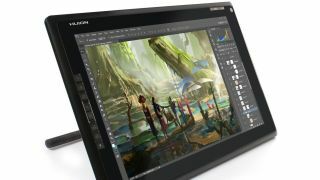 The Huion H640P measures just 10.2 x 5.8 inches and is no thicker than a smartphone, but offers a set of shortcut keys as well as its drawing area. If you have the budget, the MobileStudio offers everything you could want in a drawing tablet. With a choice of Intel Core processors and solid-state drive storage capacities, it’s a fully fledged Windows computer. But it also benefits from the same technology Wacom brings to its Cintiq pen display range, making the MobileStudio a pleasure to draw with. And if you want, you can even tether it to the more powerful PC or Mac in your studio with the optional Wacom Link. A 16in MobileStudio is also available. The Surface Book 2 delivers true versatility for the designer on the go. You can use it as a regular laptop, then twist the screen to turn it into a flat tablet with a touch-sensitive screen. For drawing, you need to add the optional Surface Pen, which provides a respectable 4,096 levels of pressure sensitivity. You don’t get the deep drawing experience of the Wacom MobileStudio, but you do get a device that keeps up with your needs wherever you are and whatever you’re doing. The latest in Apple’s series of high-performance tablets, the iPad Pro 12.9 offers a significant performance upgrade over its predecessor, as well as a reduced bezel (screen-to-edge distance) and the removal of the home button – the device is practically all screen. That luxurious LCD Liquid Retina, True Tone screen offers ‘Xbox One S-level graphics’, making it a beautiful surface on which to draw your projects, a process that has become easier than ever thanks to the reworked Apple Pencil 2 released alongside the tablet. The Pencil now offers magnetic docking and new workflow-improving shortcuts, such as double-tapping to switch modes. The new internal processors also mean the iPad Pro is faster than ever before, and even the high-storage versions offer fast read/write speeds for smooth file transfers. It's always a treat when you don't have to pay extra for the stylus, and the Samsung Galaxy Tab S4 comes with its pen already in the box – an extremely welcome touch, especially given that this is the most expensive Android tablet yet, at a price on par with the iPad Pro. Despite this, it's still the better buy compared to the more recently released S5e, which, although cheaper, does not offer pen support. Just as with Samsung's previous tablets, the drawing experience is smooth and satisfying; you'll find yourself gliding away in no time. There is a decent range of drawing apps and programs available for Android as well, though iOS still has the slight edge in this regard. Samsung's Dex software, designed to emulate a computer desktop, means the tablet is also useful for general productivity. A great all-purpose option, albeit an expensive one. It's hard to know what's more exciting about the GAOMON PD1560, the gloriously large 16:9 drawing surface or the intelligent pen with 8,192 levels of pressure sensitivity. If you can't think of a better way to spend a day than holed up in the studio creating gorgeous digital paintings then this is a terrific buy. It's easy to set up just the way you want it, with 10 shortcut keys that can be customised to streamline your workflow. However, if you like to create on the move then this isn't the one for you, given that it weighs more than 1.5kg and lacks the wireless functionality of some of the sleeker tablets available. A third button may not sound much of an innovation, but it enables the Pro Pen 3D to support pan and zoom in three dimensions, giving 3D artists unfettered navigation at their fingertips. For that traditional feel, the Inking Pen enables you to place a sheet of paper on your Wacom tablet then draw onto it with ink, while the tablet captures your drawing movements at the same time. The Inking Pen is only for Intuos tablets: it can damage the screen on Cintiqs and MobileStudios. If the Apple Pencil doesn’t appeal or your iPad isn’t compatible, this stylish pen works on any iPad (or Android tablet). The nib, combining a fine-point tip with a plastic circle to register on the tablet screen, looks curious but works well in practice. What are the different types of drawing tablet? Broadly speaking, there are three main types of drawing tablet. Each takes a different approach to the central challenge of helping you draw on your Windows PC or Mac as if you were drawing on paper.